Why Should You Take 3 Days Out of Your Schedule to Attend Dell World? From November 4-6, Dell will host roughly 5,000 customer, partner and influencer attendees at its fourth annual Dell World conference in its hometown of Austin, Texas, and up to 10,000 attendees will tune in live online. For those who are unfamiliar with it, Dell World is Dell’s premier annual customer and partner event. Having found the three prior Dell World events I attended to be both informative and fun, I was eager to find out what’s on tap for this year’s event. So I was delighted to get a sneak preview from Jeanne Trogan, Dell’s Executive Director of Global Events, about what Dell World will offer. With time arguably being our most valuable asset, here’s my take on why you’d want to take 3 days out of your busy schedule to attend Dell World based on this preview. Gain a clearer understanding of how technology can help solve business problems and meet business goals. Companies want to harness technology for better business outcomes, but it’s often hard to figure out how to do this. According to SMB Group’s 2014 SMB Routes to Market Study, small and medium businesses (SMBs) increasingly view technology as a means to automate operations and work more efficiently, and as a vital tool for creating and sustaining a vibrant, growing business (Figure 1). 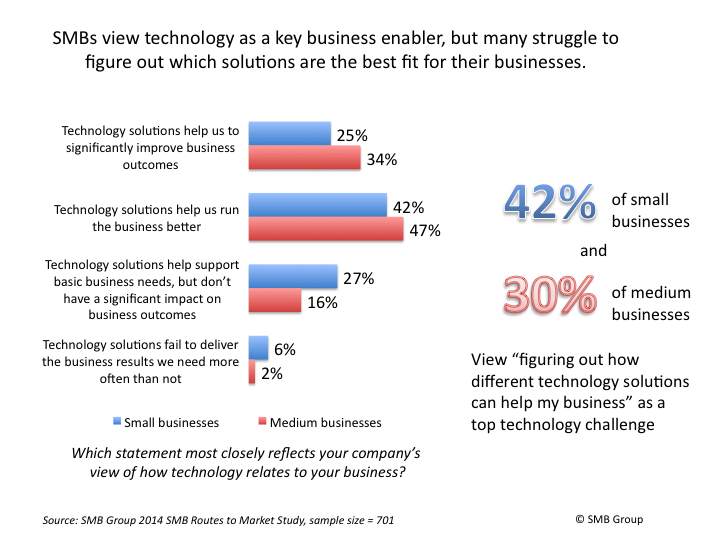 But the same study also shows that figuring out how different technology solutions can help their businesses is a top challenge for many SMBs. With this in mind, Dell World will provide customers–from SMB to large enterprises–with high-level advice and expertise to help them understand how and why key technology trends are reshaping business and consumer practices and behaviors. Keynote speakers, including Dell CEO Michael Dell and other tech and business innovators from business and academia will put cloud, mobile, analytics, security, the Internet of Things (IoT) and other trends into sharper focus, and help attendees stay ahead of the technology curve. Learn how to turn strategy into reality. Refreshing your technology strategy and direction is the critical first step, but then you have to figure out how to execute. 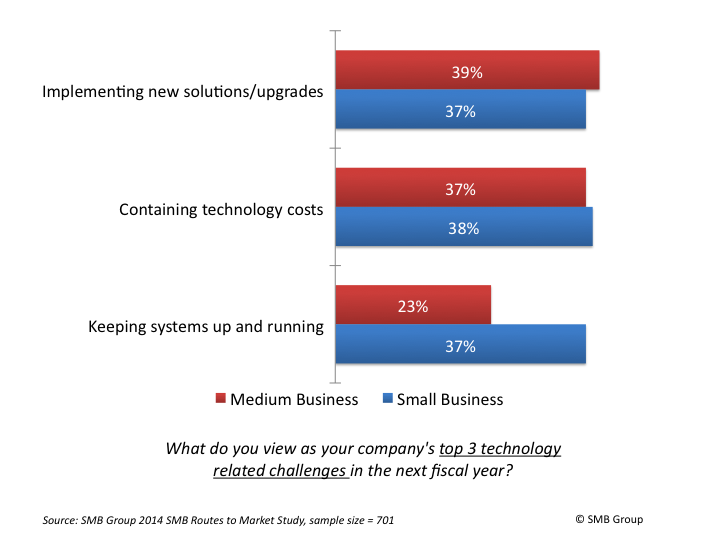 In fact, figuring out cost-effective ways to implement and/or upgrade solutions and to keep them up and running are also daunting challenges for SMBs (Figure 2). Dell World is chock full of interactive sessions as well as hands-on labs and demos to help attendees kick the tires on new solutions, and fulfill the new technology requirements that their businesses require. Attendees can choose from more than 70 breakout sessions for a deeper dive into how to make technology work for the business. For instance session topics range from how to conquer cloud chaos to how to maximize mobility benefits without compromising security, and labs address areas such as big data and analytics, desktop virtualization, and streamlining IT management. In the Solutions Expo, attendees can get an up close and personal look at the latest solutions. This year, Dell is reorienting the Solutions Expo from a Dell product-centric approach to a customer-centric problem and solution approach. The floor will feature different paths that start with technology problem areas, and guide customers toward relevant solutions and information. I think Dell’s refreshed approach to the Expo floor and demonstrations will be something that customer attendees will appreciate. Just like when you were in school, sometimes the most important learning you do takes place outside of the classroom. Networking is a key part of Dell World with other attendees for fresh perspectives, exchange information and compare notes, not just at the event, but over the longer term. In addition to the serendipitous meetups that will happen spontaneously throughout Dell World, Dell is also scheduling meetings, such as an Executive Summit for CIOs, to facilitate peer-to-peer interaction. If you’ve been there, you know what I’m talking about! If you haven’t been there, you’re in for an amazing experience. In fact, Dell keeps asking attendees where they want to have Dell World, and people want to come back. Austin has something for everyone, whether you love music, great food or the great outdoors. For starters, Dell World will feature both Weezer and Duran Duran in concert–something for everyone from millennials to baby boomers. Get some fresh air with a walk or run around Town Lake, and grab a bite or drink at the Hula Hut as a reward. At night, check out the live music and gourmet food trucks on Rainey Street, or at Austin City Limits. 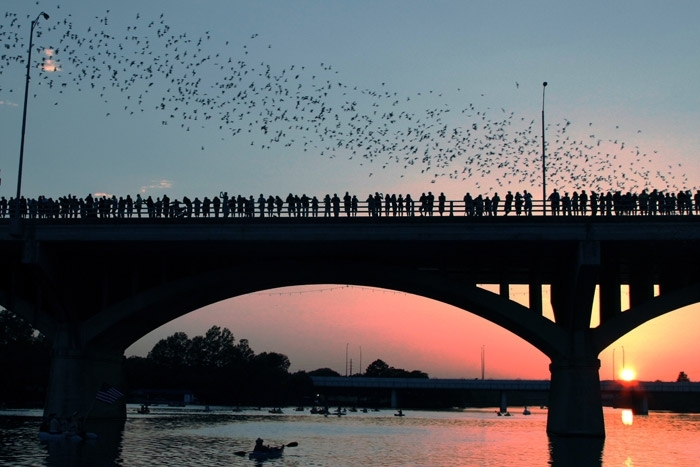 And don’t forget to check out the nightly bat migration under the Congress Street Bridge. Last but not least, there’s the history–Dell was born in Austin in Michael Dell’s University of Texas dorm room. Since then, Austin has grown as a tech mecca. Dell World also marks the one-year anniversary since founder Michael Dell won an extended battle to take the company private. In a recent CNBC interview, he expressed how liberating its been to off the Wall Street treadmill and able to focus on customers, and invest more time, R&D and energy on their behalf. I have a feeling that attendees will probably pick up on how this more positive energy is coming to fruition at Dell World as well.